Natural Sanctuary since 1982, the Moon Valley is a wonderful place with colorful geology. Located in the Sierra Obate depression, 2550 meters above sea level, it has different visual attractions that turn it in an extraordinary place called "Moon Valley" because of its similar look to lunar soil. The Moon Valley is a perfect place to contemplate desertic nature, without flora, fauna and humidity. Visual attraction. Amazing geological forms. Bicycle ridings, climbing, sandboard, photography. Santiago - Antofagasta: Airway and land route, by Panamericana 5 North. Antofagasta - Calama: Land route, by Route 25 CH. Airway. Calama - San Pedro de Atacama: Land route, by Route CH-23. Public and private transportation. 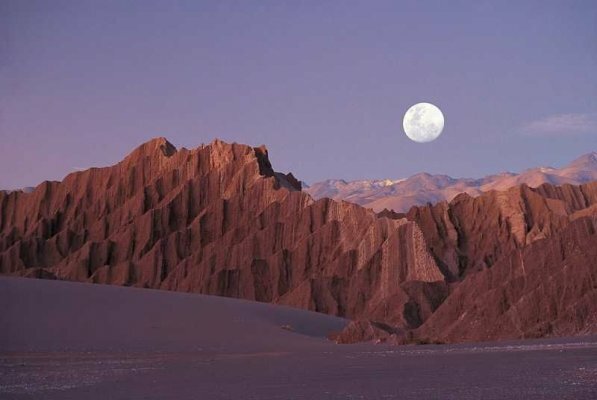 San Pedro de Atacama - Moon Valley: Land route, by Route CH-23. Desert weather. The temperature oscillates between day and night time, and the summer rain is more frequent with a high media of 3 milimeters. The high media temperature is 24,5ºC and the lowest is 17,1ºC. Housing, food, transportation, outdoor activities, handmade crafts, camping. Tulor town, Puritana springs, Cordillera of the Salt, Chaxa Lagoon, Tara Lagoon, Miscanti and Miñiques, Peine, Quitor Pukara, Jere Stream, Los Flamencos National Reserve, Atacama Salar, San Pedro de Atacama, Socaire, Toconao, Moon Valley, Licancabur Volcano.